Big Foot’s VRF mounting systems ... versatile. Following its successful participation at The Big 5 show in Saudi Arabia early this year, the UK-based Big Foot Systems is eagerly looking forward to further success at the event in Dubai. “We thought The Big 5 Saudi was by far the best show we have ever visited. Our stand received representatives from some of Saudi Arabia’s biggest contractors and so it was a very positive exhibition that resulted in contracts,” says Joe Rose, the company’s technical marketing manager. “Having had such a successful show at The Big 5 Saudi, which generated lots of interest in our products and has helped us obtain contracts in the Middle East, we are excited to exhibit at The Big 5 Dubai too,” he adds. At the event, Big Foot Systems will be showcasing its non-penetrative rooftop support systems for mechanical services and safe access equipment that are suited for the regional construction market. “For the Dubai construction market, non-penetrative rooftop support systems make perfect sense and Big Foot Systems are the obvious choice, offering the largest range in the world,” says Rose. A Big Foot stand range for small air-conditioning units will be launched at the exhibition along with other products used in the UK that are now available across the GCC. Big Foot Systems designs and makes freestanding systems to support plant equipment and services installed on flat roofs. Its support products provide quick, versatile and economical solutions for building services, solar and access equipment with its simple, safe and secure non-penetrative roof support systems. The company says it has the support solution for everything from cable runs to kilometres of safe access walkways. Rose says the company will also showcase its popular heavy-duty (HD) range, which includes the Big Foot HD Cube framework designed to offer a complete, efficient and robust solution. 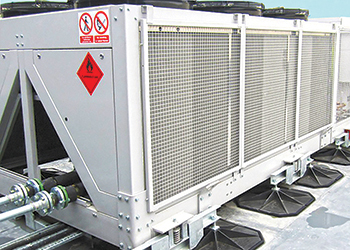 This range has been specifically manufactured to support heavier building services on flat roofs, such as chillers, packaged plant and large air-handling units. Also on display will be Big Foot’s services support and light-duty (LD) ranges, which are described as being the ideal support solution for auxiliary services and smaller air-conditioning and air handling units. “These high-quality products are made from galvanised steel, making them the most robust support products on the market, and are available at prices that bring into question the use of other, alternative solutions,” says Rose. He adds that service containment such as ducts, pipework and cable ladders/trays can be supported using a number of products from the services support range, including the Fix-it Foot, the Multi Foot and the H Frame Set. Designed to protect lightweight modern roofs, these offer a range of benefits including cost- and time-effective installation, and improved system aesthetics without penetrating the rooftop. Furthermore, also featured on Big Foot’s stand will be its Safe Access Systems. “Offering secure and easy access to rooftop building services, the Safe Access systems provide standard site-assembled, safe access walkways, platforms and step-over solutions,” says Rose. Big Foot Systems’ services also extends to include surveying and designing bespoke Safe Access systems tailored specifically to meet individual design parameters. Visitors will also be able to learn about Big Foot’s technical services and see how its expertise allows the company to work with its clients to design bespoke solutions to their construction challenges. Big Foot Systems offers technical support underpinned by 3D CAD and a full quotation facility. 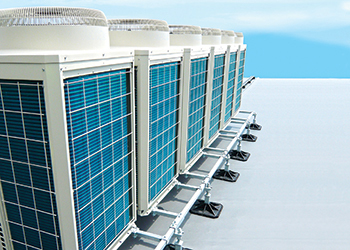 In addition, its technical department uses Ansys FEA software to provide custom-made one-off solutions to meet the demanding environment present on some of today’s roofs. Big Foot Systems ... HD range. Commenting on business recently, Rose says the company has experienced good growth across the GCC region over the last 12 months. Hence, Big Foot is in the process of establishing an office in the Middle East. 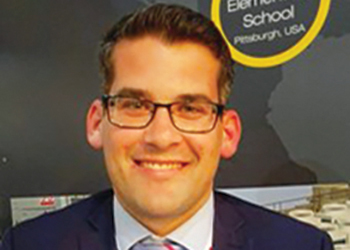 He says with the help of a dedicated GCC project engineer solely working on GCC projects, Big Foot Systems has introduced additional design services to the region. “This has ensured customer deadlines are met and we can provide second-to-none design service in all other territories,” Rose emphasises. With regard to projects in the UAE, Rose says Big Foot Systems has already been active in Dubai with its non-penetrative supports. He says Big Foot’s frames were used to support pipes on the inverted rooftop with supports placed onto the insulation. The finished result was an installation that was neat, secure, stable and makes rooftop maintenance easier and safer. Big Foot has also been supplying support systems to the Mall of Emirates in Dubai which is undergoing an extension and retrofitting. It is now working across the wider region particularly in Qatar and Oman, having mainly started with projects in the UAE. Big Foot Systems was established in 2001 with a head office in East Sussex, the UK. Big Foot can be visited at Stand 2 B61 at The Big 5 show.